Our consulting blog is designed to help you learn more about doing SEO yourself. Find useful insights to drive decision making for your small business or blog. Access industry topics spanning the space, from the impact of Google+ on ranking, to the best tools for keyword research. At ELM Consulting we teach brands and bloggers how to find the keywords searched by the target audience. Then we train on how to write authoritative content used capture and engage this audience. Literally, the smartphone ad was in the street! 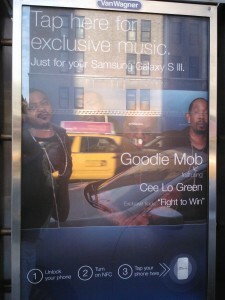 Here is the story; walking home from the office on Wednesday I came across this Samsung Galaxy smartphone advertisement. I have to tell you this was really cool. 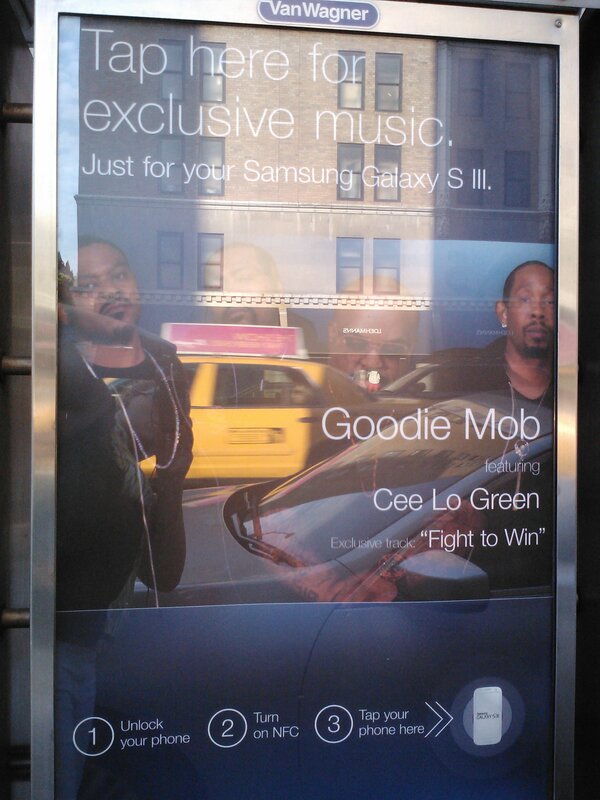 You could place your galaxy smartphone over the ad (bottom right corner) and download a free song from Goodie Mob. The guy in the car behind me (reflected in the photo), might have been a little spooked out though when I was standing in between his car and the phone booth to snap this phone, but in someone with a galaxy phone – theyd be standing in the street to get a free song. Given this is New York City, and many of us use smartphones – the Samsung galaxy for some – it is wise to have advertisements like this. However, it is NOT WISE to have them on phone booths facing the main thoroughfare of 8th avenue during rush hour, when buses and cars are rushing past — many of them not totally paying attention to the intersection, because well they too are on their smartphones! Samsung makes a great smartphone product, and they continue to be a top competitor in the mobile market. Of course the placement of this ad was the fault of the company putting up the marketing materials, not Samsung directly. © SEO Training 2012 All Rights Reserved.